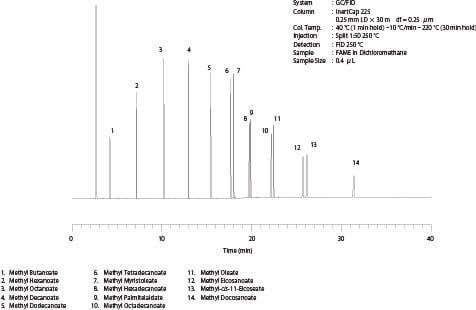 InertCap 225 is a medium polar column incorporating 50% cyanopropylmethyl and 50% phenylmethylpolysiloxane. Cyano group contained in the liquid phase has a triple bond so it retains compounds with the high degree of unsaturation strongly by dipole interactions. Therefore InertCap 225 is useful for separating geometrical isomers in FAME analyses.